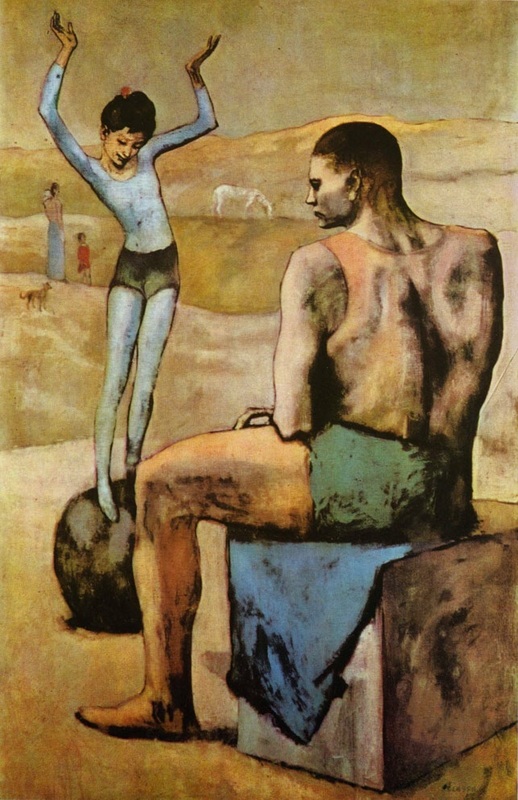 Sample activities from the eBook TEACHING ENGLISH WITH ART: PICASSO | Jorge Sette "Linguagem"
Describe the picture. What’s the predominant color? This is a painting from Picasso’s Rose Period (1904-1906). Everything is kind of pinkish. How was Picasso feeling during this period? Why do you think so? What does the color pink remind you of? Who are those people? What’s their relationship? Where do they work? The girl can stand on a ball. This is difficult to do. What else do you think she can do? Can you do anything difficult? What? What’s this girl like? Tell us about her personality. What about the man? Describe the girl physically. Now describe the man. What do you think she likes doing in her free time? What do you like doing in your free time? Do you like the circus? What do you usually see in the circus? Pair work: students are divided into A and B. Student A lists the positive points of a circus. Student B disagrees and says why. Make a poster of a circus (a drawing or a collage or both) and present it to the class. Write a composition imagining what your life would be like if you worked for a circus. Tell us about your job. What you usually do. The different kinds of people you work with. Do your relatives work there too? Who? (Do some research on the Internet to find out what kind of life circus people live. Use your own words in the composition. 400 – 700 words). Read your partner’s composition. Help her correct some mistakes and ask questions to help her write a more complete and better composition. Then ask her to help you with yours. This entry was tagged aprender ingles, art, CLIL, colors, content marketing, cubism, design, ebooks, edtech, education, english, ensino de linguas, gertrude stein, guernica. Bookmark the permalink.